Made entirely of cotton, this custom cap is a 5-panel snapback. It has a classic red plastic closure. 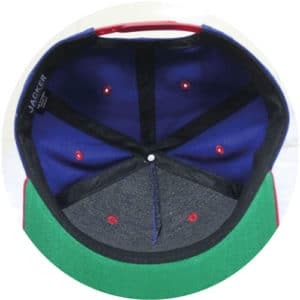 In addition, this snapback is tricolor with a royal blue for the crown and a bright red for the top of the visor and, finally, a green for the bottom of it. 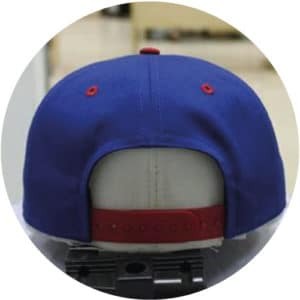 Let’s zoom in on the outside of the cap. As we said, this nicely bright tricolor cap. A red and white flat embroidery on the front has been added to make a reminder with the visor’s red. We generally advise you not to use more than four colors on the same cap. Inside, a woven label and a satin label are present near the absorbent band. Who’s The French Jacker ? 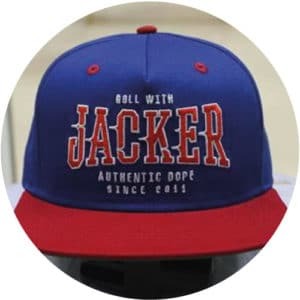 Jacker is a French brand of streetwear clothing and skateboarding. For men but also women, it’s a young brand that reaches a wide audience. 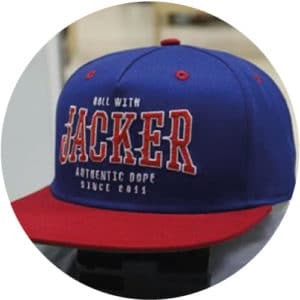 Jacker is also a magazine, published quarterly, it is free and talks about street art, graffiti, music, extreme sports and lifestyle. Visit their website to discover them.